SAN DIEGO — The 684-foot Navy vessel Anchorage made its maiden voyage through San Diego Bay Nov. 21, docking at Navy Base San Diego. The $1.3 billion amphibious transport dock is the newest of the Navy’s San Antonio-class fleet, completed Sept. 17 by Huntington Ingalls Industries (HII) Shipbuilding site in Avondale, La. After leaving Louisiana Oct. 30, the ship with a 105-foot beam transited the Panama Canal’s 110-foot-wide locks, making it one of the largest classes of ships to have safely passed through the canal. At 10 a.m. Nov. 21, the ship passed under the San Diego-Coronado Bridge for the first time. Fire Controlman 1st Class Michael Keller was among the first crewmembers to report to Anchorage while the vessel was under construction, arriving in Avondale more than a year-and-a-half ago. “The entire process was amazing to witness and be a part of,” said Keller, who is a San Diego native. “When I got to Anchorage, she wasn’t even painted. There were wires everywhere, scaffolds, and decks were bare metal. 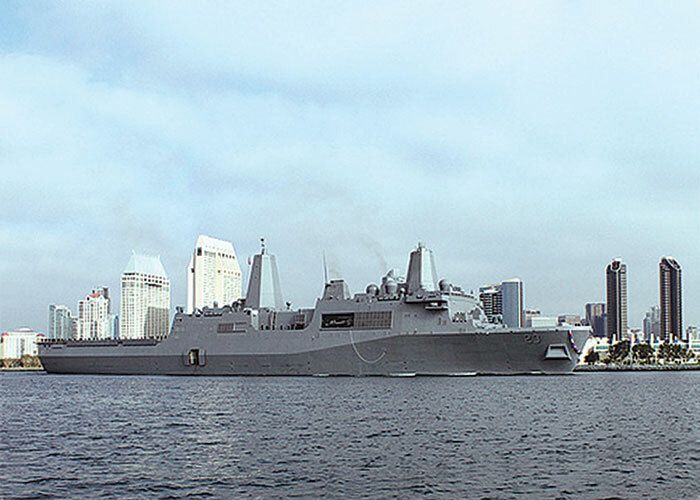 As the newest member of San Diego’s 62-ship naval fleet, Anchorage’s primary mission will be to transport Marine Corps forces in a variety of expeditionary and special operations using expeditionary fighting vehicles (EFVs); landing craft, air cushion (LCAC); tilt-rotor MV-22 Ospreys and CH-46 Sea Knight helicopters. The ship’s crew will spend the next few months working on certifications and completing installation of ship systems prior to heading up the coast to Anchorage, Alaska, where the ship will be commissioned in May.